That which is described here in a few words is an exceptionally complicated and laborious process, comparable in some ways to the production of an animated film in which tiny individual movements are pieced together to form a flowing sequence of motions. Anybody who has attempted to produce music in this fashion knows how miserable the first attempts sound. Once you learn how to effectively use the means and parameters available, you realize what a powerful tool you have at your disposal, a tool with which astonishing results can be achieved. It naturally takes a while before the first acceptable interpretations come about. And, of course, not all the nuances of a live performance, which is an extraordinarily complex tonal structure, can be reproduced. With the help of the technique described here (step-sequencing), it is however possible to achieve a high degree of approximation, and to make the character of the work audible. In contrast to this we have live recording (realtime sequencing), which is a method preferred by pianists. The product is a MIDI sequence that directly reproduces the live performance of the player. The representation of the notes in MIDI format does not follow in accordance with the rhythm, however. My interpretations (MIDI, MP3, CD) were created using the step sequencing process exclusively. I was born in 1948 in Potsdam, Germany. In the family in which I grew up, we often made music. So it was really a matter of course that I learned to play several instruments. I played in small ensembles, and enjoyed studying the scores of large orchestral works. Besides music, I developed a decided inclination toward mathematics, which I ultimately chose as my major at Heidelberg University. Till 2009 I was employed as technical controller in a large company in Munich. In 1996, I discovered that with the help of MIDI it was possible to interpret works without having to play them. I found this possibility so fascinating that I delved intensively into the interpretation of piano music. I noticed that there are many possibilities of creating a lively interpretation out of one that at first sounds stiff and synthetic. 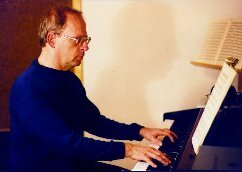 Since 1997, I have placed MIDI sequences on the Internet, initially in public MIDI archives, later, on my own web site, making them available free of charge to all classical music lovers. Since 1999, I have also offered the works in MP3 format and since 2007 in OGG Vorbis format in addition. My equipment consists of a PC with a Soundblaster Live Card. For the creation of the MIDI sequences, I employ Sonar 2. For recordings in audio format, I have a Roland HP 330e digital piano at my disposal.